Wow, when I take a break, I REALLY take a break! But I am back with a phenomenal post that includes a huge chance to win an awesome prize!! 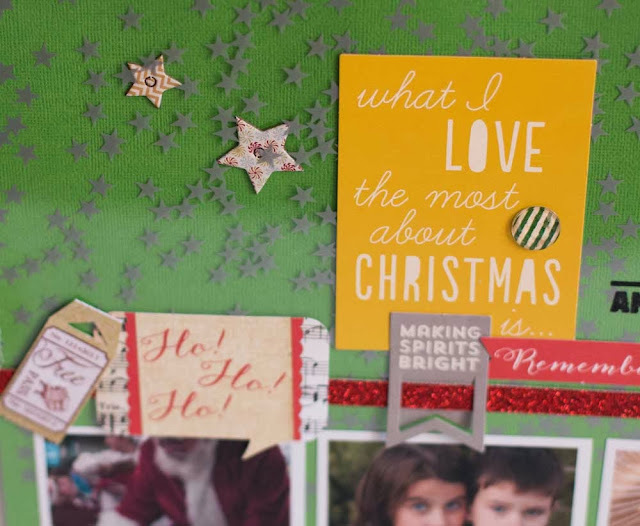 The creative team at Scrapbook Circle is ending the year with a bang! We are hopping along and you can win an All Is Bright December kit from Scrapbook Circle. 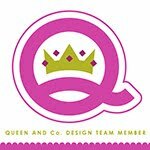 Each Creative Team member is giving away a kit on their blog. That's right — 12 chances to win! We are celebrating the holiday season and YOU get the gifts! You should have come to my blog from the fabulous blog of Jenni Calma. You can also start at the Scrapbook Circle blog. And you can stop back by there to see the full hop list and get some more details. The transparency was my FAVORITE item in the kit and I knew my first layout was going to feature it. I generally struggle with transparencies. But this one was so easy to use with it's simple but fabulous star pattern. 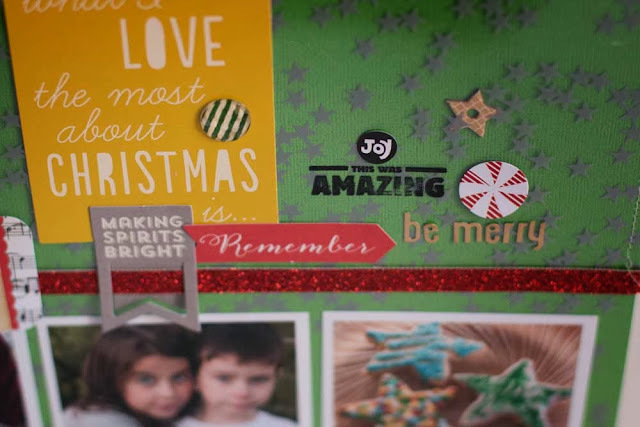 I simply layered it over green cardstock from the December Cardstock Add On and hid adhesive behind the photos. After adhering some of the red glitter trim, I decided to stitch a border around the top edge. I had fun layering the Fancy Pants chipboard stars UNDER the transparancy. I used the exclusive Scrapbook Circle stamp and Staz On ink so it wouldnt smear and stamped on the transparency. Just that in and of itself was enough to stress me out ;) but I like the way it turned out. I've already made 4 layouts and a card with the All is Bright Kit and Holly Jolly add on and I am looking forward to making more! Your next stop on the hop is the incredible Tessa Buys, so run over to her blog right now! 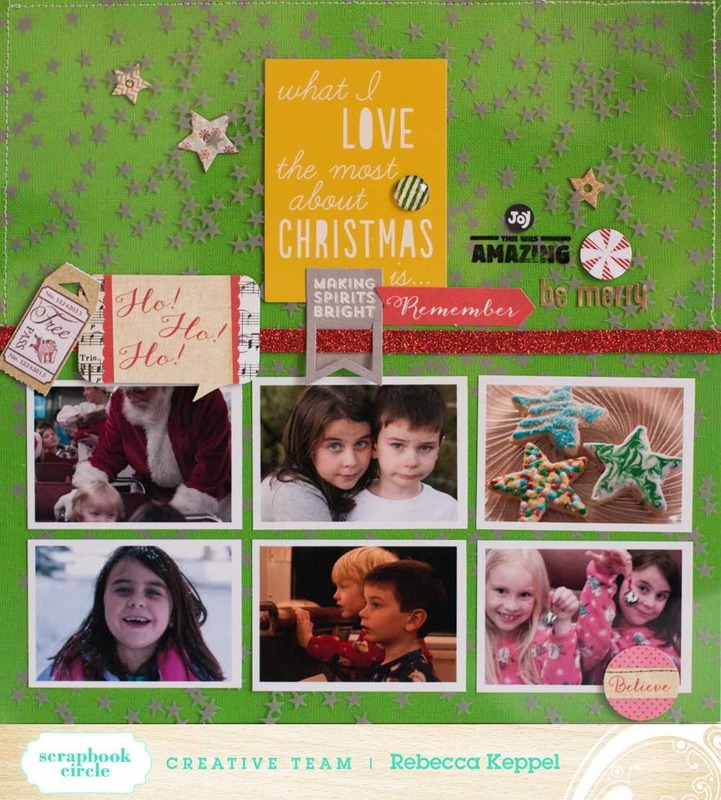 Keep hopping and leaving comments as you go, so you have up to 12 chances to win the December kit from Scrapbook Circle. Good Luck! This is just fabulous Rebecca!!! Love the transparency! I second that; this is such a festive and merry kit! That transparency is so much fun! Loving this kit!!!! I always love seeing pages with several photos on them. I think sometimes we get carried away with all of the stuff we put on the page and forget why we are scrapping....this rocks! Fabulous layout! The transparency is a must have! The star transparency is very cool! It adds a fun layer to such a festive kit! Love it all! LOVE all the mileage I get from SC kits! FABULOUS LO I LOVE transparencies! Great job! Woo HOO! This is so cute! Love the transparency and red glitter trim! Love your use of the overlay! Such cute pictures too! So much fun! Beautiful stuff! Thanks for the chance to win! you rocked that transparency girl, and i love the addition of MORE stars under it! Love how you used this transparency. This is such a fantastic kit with so much great stuff! I love how you used the transparency...like a giant shaker page! Great page! Thanks for the chance to win! LOVE LOs with lots of photos. Wonderful job!!! Love how you added all those photos but they don't overpower each other, they compliment...looks so pretty! Gorgeous! I am loving that fantastic star pattern, the pictures just pop against the green too! Such a perfect page! Cool grid design and I love how you used the transparency! Love the use of the transparency. The added stars really add to the page. Great job. what a cute page LOVE all the stars!!!! This kit looks fabulously festive! Your photo placement is fabulous! Love this layout! This is great - very creative! That transparency makes the perfect background! Love your layout! Love the kit and the layout you made with it. Thanks for the chance to win it! Your layout is stunning! Love how you used the transparency and that you placed several photos! Gorgeous! Thanks for the inspiration and for the chance to win! You were drawn as the winner from my blog! Go check out the Scrapbook Circle blog to get your kit! I love all the stars! Thanks for a chance to win! what a fun layout! thanks for the opportunity to win this great kit. I like how clean and simple your layout is - inspiring! Lovely page! I love the multiple photos! And the way you used the transparency! Lovely page! Love the touch that the transparency add! Super cute pics!! Love the layout! Great page, your photos are amazing! Love the simplicity of the transparency over cardstock. Great layout! Thanks for the chance to win! I'm loving all those stars! I had not spotted the transparency - love those stars and all the other stars you added. What a happy, joyful page! thanks for sharing. Enjoy the time with your family! LOVE LOVE LOVE all the STARS on your layout! Love the transparency! Super cute layout too! You used that transparency beautifully and how cute your red tape and tab look like a santa belt! The kit looks gorgeous! Love how you used the transparency! I love the layering behind and on top of the transparency!!! Great collection of photos, too! Fun! I love that transparency too. Great layout!! i love the grid and that transparency! great page! thanks for the chance! You really used that transparency well. I love the layers on this page. love the glitter ribbon acting as a belt! what a GREAT layout-love how many pictures are on this!